...or: How to have a wonderful day even though your feet are killing you. Yesterday I went to Amsterdam to listen to a lecture given by two of the Rijksmuseum's art restorers. Head of the restoration department Paul van Duin and junior paintings restorer Lisette Vos talked about the restoration of the Beuning room, a Cuba mahogany Dutch Rococo room made for merchant Matthias Beuning in 1748. As the Beuning room originally came from the Amsterdam canal house at Keizersgracht 187, and many elements in my first 12th scale canal house are based on an Amsterdam canal house in the Dutch Rococo style, you can understand why I was interested in going to this lecture. 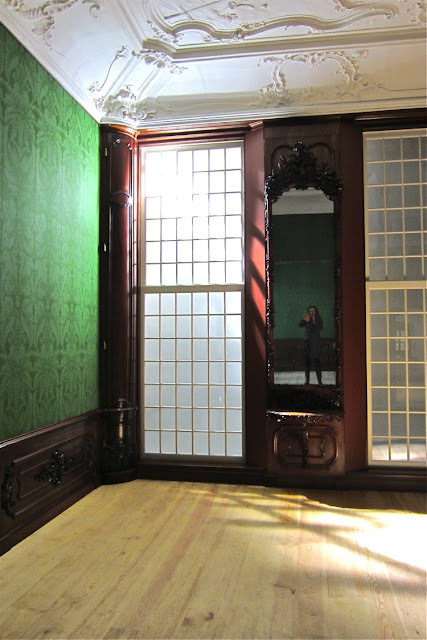 I really enjoyed hearing about the restoration of this room. The restoration of the ceiling and the choices they made in the way the room is displayed had my particular interest as this is information you don't normally have access to when visiting a museum. It was interesting for me to find how much knowledge I had already, just from doing research for my dolls house! I spent the rest of the afternoon browsing some of the galleries at the Rijksmuseum. As you may know, the museum opened last Saturday, after a remodeling job which lasted ten (!!!) years. The new entrance is a beautiful, light and spacious Atrium which I really liked as a contrast to the more intimate feel of the galleries. Anyway, once I arrived at the 18th century gallery, I found this miniature related piece I would like to show you here. 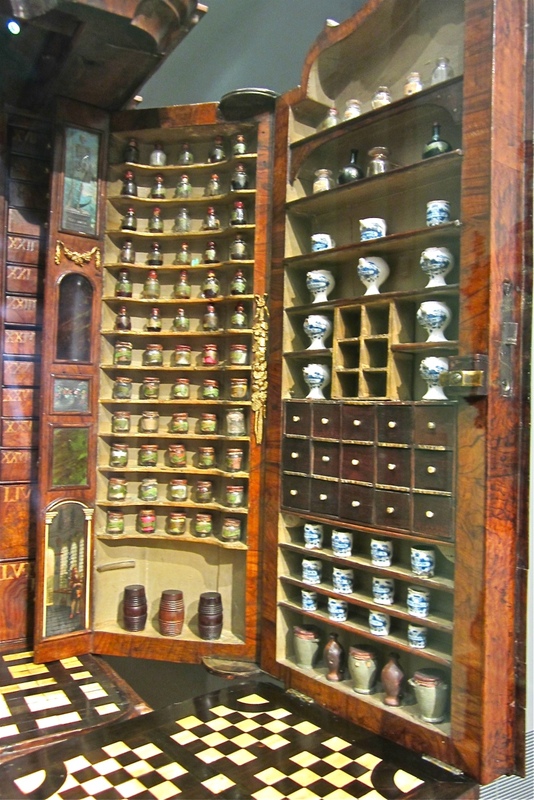 It is a ' Simpliciakast' or Collectors cabinet from 1730 which holds all kinds of medicinal ingredients, as well as minerals, fossils, wood samples, seeds, etc. It has still has the original 92 Delft faience pots, 148 glass bottles and 61 wooden barrels. So beautiful! I loved the small painted panels with the ivory columns on the inside of the doors. 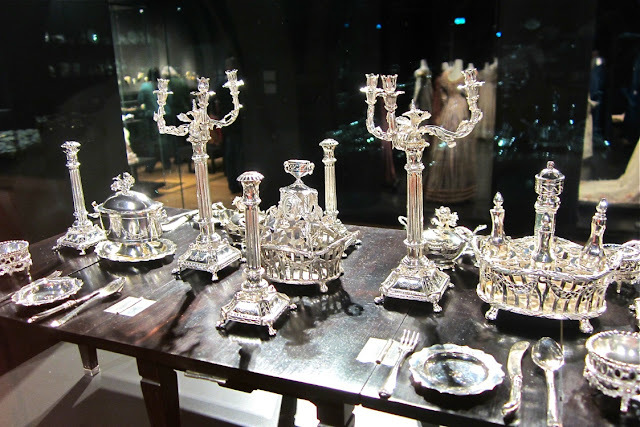 In another gallery I found the collection of silver miniatures which has also been on display at the large dolls house exhibition last year in Den Haag. I think I showed you a photo of this table laden with gorgeous silver tableware last year as well. I still love it! This mid 19th century kitchen room box , filled with 18th century silver miniatures (also at the exhibition last year) is part of the permanent collection at the Rijksmuseum. 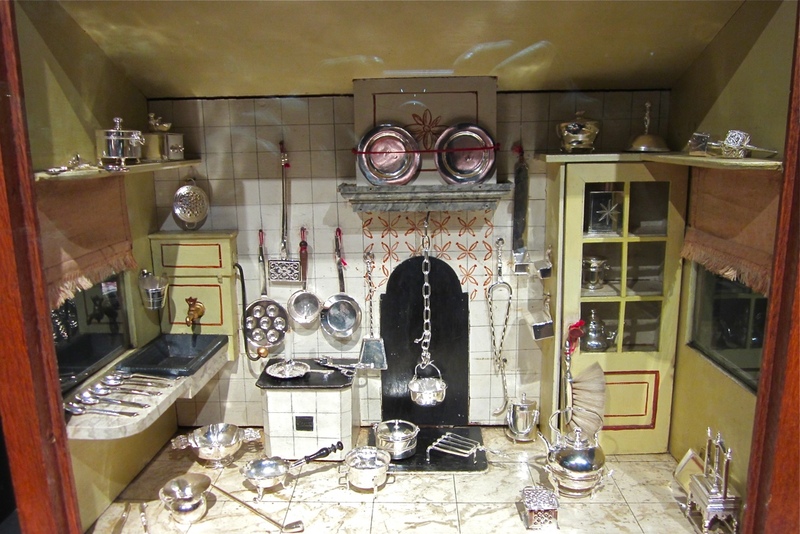 There are many more miniature related objects to discover at the museum (there's a whole gallery full of beautiful ships models) and of course...the three fantastic dolls houses! I didn't have time to look at them yesterday though, they will have to wait until my next visit. Que maravillas!!! Es impresionante la creatividad de la gente,imagino lo que disfrutarías en el museo,gracias por compartirlo. The museum is filled with wonders! I'll have to go back often to enjoy them all. I hope to go back next week and see the three dollshouses. I'll report about it then! Thank you so much for posting these pictures. TWhat and incredible rooma nd the furniture and silver just take my breath away. What incredible craftsmanship. You're welcome Giac! I am so happy to finally be able to go and see treasures like these close to home again. The detailing in the room is incredible, the photos don't do it justice at all. I love seeing photos, and I do a lot of my research from books and online, but there is no substitute for seeing the real thing! And the have the restorers explain everything makes you see and understand even more. Oh, beautiful, Josje, well as you know I have been thinking of visiting the museum in June, you just confirmed that it is something not to be missed, now I just hope I don't get lost in there. I find all these big museums a bit confusing, but a map normally helps, I do suppose they will have one. 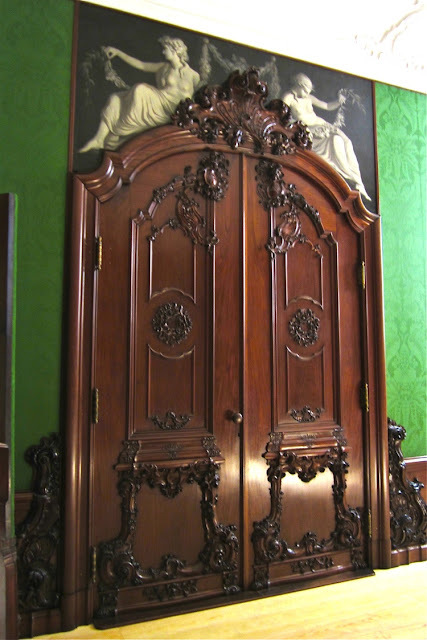 Thanks for posting all these beautiful photos, I love that Collector's cabinet, wouldn't it be marvelous in miniature! I'm sure the museum will have sorted out their little problems by the time you visit Elga. I did have a map, but even with the map it was confusing. 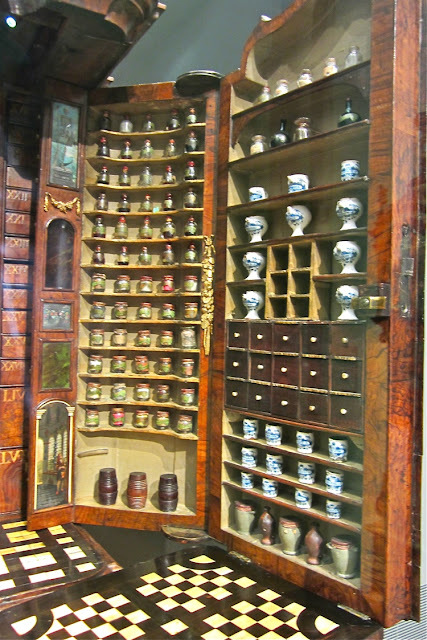 The collector's cabinet in miniature would be stunning, but I think it would be very difficult to copy all of those small pots and botttles. Those are very small already! Very beautiful furniture and decorations! The Simpliciakast is absolutely gorgeous! I've never seen anything like that before, the workmanship involved must have been so time consuming! Thanks for posting. Kind regards, Brian. Your welcome Brian. Yes, the workmanship in these pieces is incredible. But then that is true for a lot of the pieces in the museum. Thanks for sharing. It's a long time ago I visited the Rijksmuseum. This are beautiful pieces for a dollhouse. You need a lot of craftsmanship to make these items. Absolutely gorgeous. I would love a chance to see these up close. You are very fortunate. I do feel very fortunate! At the first look at your post, I was thinking that you had made another fantastic room :) I hope to one they it will be possible for me to visit the museum. I hope you'll be visiting the museum one day Mona! Oh I wish this was a room I made in miniature, haha! Dank je Xandra. Die lezing was leuk ja, ik hoop daar vaker naar toe te kunnen. De poppenhuizen heb ik ook al een tijd niet gezien (behalve het grote grijze grachtenpand dat ook in Den Haag stond), dus daar ga ik de volgende keer eerst weer eens naar kijken! I think you are joking with us, Josje! These rooms look more like miniatures than the rooms you make! Is it an upside down world? Haha, I wish Shelly! But in that first photo the room does look like a miniature doesn't it? It may have something to do with the empty fireplace, the clean new wooden floors and the missing shutters and drapes which makes you think it may not be a real room. It would be beautiful in miniature, but very difficult to make as the detail on the mahogany and the ceiling is very intricate...but oh! it would be a dream! Yes it is so nice that most museums allow you to take photos, as long as you don't use flash. Haha I would be the master miniaturist if this would be my work! I think I could manage the ceiling (if given enough time) but the wood work...no! Debora could probably pull it off but it would be an enormous job! On the right it says 'evenementen'. Depuis que j admire votre maison , je rêve d aller à Amsterdam pour admirer les maisons du grand canal . C est un rêve qui va devenir réalité car début Mai nous partons 4 jours visiter cette ville . Je penserai à vous . Je ne sais pas si j arriverai a emmener mes filles visiter le musée ... On ne sait jamais ... Hihi ! Je viens de regarder sur internet . C est une idée formidable . Je ne connaissais pas ce musée . J ai fait une promesse à mes filles ... Un musée chaque matin et après midi ...shopping ! Tout le monde va être content . Merci beaucoup pour ce conseil . What a stunning room, I love the rich colours of the walls and the deepness of the wood against the white of that magnificent ceiling , it is all very dramatic, thats just the sort of opulence I enjoy....not too much bling. Welcome to the 6ft in heels club....sometimes I'm more than that in heels.....just as well I have a tall husband, but you look very sassy in the photo, you suit the room very much! I just adore the double doors with the black and white painting above and the Emerald green wallpaper, the three elements just work so well together. The simpliciakast is amazing, so many beautiful little jars and urns and those tiny paintings are just gorgeous, I think you could spend a long time examining every little piece.It is so easy to loose time in a museum. How nice to have been part of the lecture, I hope it was very beneficial for you. Thanks for the post, I really enjoyed the peak. It's funny you mention that there's not too much bling, as that is exactly what makes this room so very Dutch Rococo. 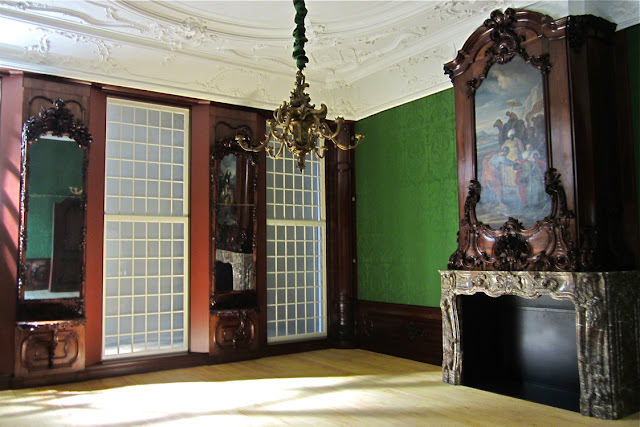 Calvinism and protestantism were a big influence in Holland and as the owner of this room was a 'Hernhutter' (Unitas Fratrum) even an opulant room like this shows great restraint. The green fabric on the wall is new and especially woven in England and installed by a specialist from.....Australia!! The restorers didn't have any clues as to which clour the fabric would have been originally, so they picked this historically correct colour which they felt would work best. 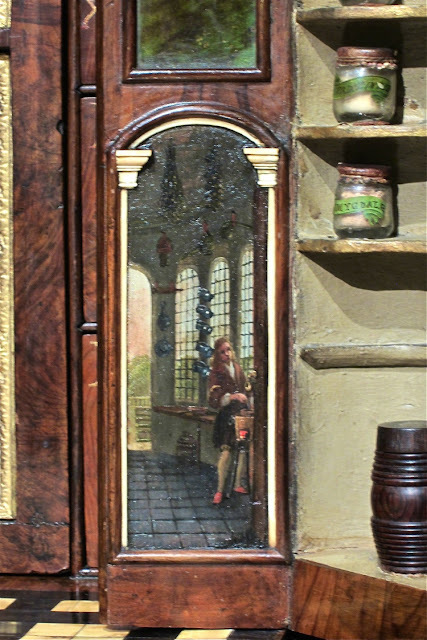 The painting above the door is actually 40 years later than the original room, so no longer Rococo, but as it was a change made by the original owners the museum decided it should be kept in there. And I agree with you, the three elements work well together! Yes I really enjoyed the lecture. I just found out yesterday that there will be a lecture on the Simpliciakast this Friday, isn't that a coincidence? Sooooo I'll be back in Amsterdam in a few days time! Haha, the six feet in heels club...Officialy I am 1.78m but I think I have shrunk a cm already, so depending on the height of my heels I am usually 6 feet or taller. PS: Thanks for the link, I enjoyed that! I'm astounded that it was an Australian specialist ....I would never imagine such a thing....they were probably trained in Europe! Well, I'm about to read your new post, so see you again soon! Yes quite possibly there is something inherently Dutch which shows through in some of the Dutch miniaturists which you like. The Australian specialist may have been trained in England, as this is where the fabric was commissioned from and the weaving company recommended him, I believe. Fi, people are getting taller! When my son was still in elementary school I was always surprised by how many of the mothers (mostly 10-15 years younger than I) were taller than I am. My son just turned 14 and is already 1.86! I hope he is like me and stop growing at 15 or so. I dread him being 2 meters tall! I don't know how old your girl is, but I hope she'll stop growing soon. But with two tall parents, it is no wonder she is getting tall too! la salle au 1/1 est impressionnante par la hauteur, le plafond , la porte sculptée ... Superbe ! Les miniatures sont extraordinaires, un musée où je passerais beaucoup de temps, quelle chance vous avez ! Merci Josje pour ce délicieux moment partagé ! You're welcome Rosethé! I hope to be back there often, starting this Friday ;-) I'll try to take some more photos to show you here. The Rijks, as some fondly call it, is open again!!!! I think you're incredibly brave (crowded?) to go within a week of opening but i totally understand. I mean, closed for 10 years.... You've done great, attending a lecture like that, indeed insight information you'd normally wouldn't hear! I envy all the craftsmen and skilled restores who helped bring the building back to life again. And the art & artifacts displayed too, of course. I think i watched almost all the documentaries about it on Dutch television ? :) I remember how I, after my graduation, pondered to continue to study restoration techniques. Unfortunately it was not offered here in The Netherlands (yet) so it would mean studying at a German University. And languages were never my strongest point. Ooh well, I won't dwell on it, i'm simply glad others DID and thus made it possible for you to enjoy the Beuning room. And everything else. Thank you for sharing, i can't wait to go there soon too!!! As it was possible to reserve a seat for the lecture, I thought I'd just go and see if the museum would be crowded or not. And it wasn't! There were lines to get in, but inside the galleries it was nice and quiet. That may have something to do with the fact that I did not visit any of the popular rooms like de Nachtwacht etc. Even though I studied History of Art at University, I never thought of going into restoration. I think it would have been the perfect study for me, I would love to do that kind of work! I think you would be very good for that type of work as well. Bit late for that now, haha! Thank you for sharing these wonderful photos! Incredible miniatures that never cease to amaze me. Most admirable artists that created such treasures. Hello Josje! I also thought that the first photo was a new room in a house that you have done! All the elaborate ceiling plaster work and the fabulous floor and the carvings on the wood paneling is indicative of the kind of work that you do! I enjoyed the quick tour of the museum and the miniatures that you have presented here. The Dutch have always real flare for miniatures and the baby houses that are in that museum must have a lot of tourist traffic anxious to view them. 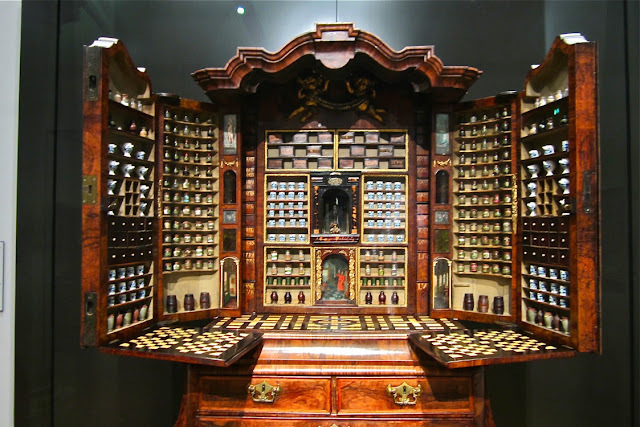 Thanks for giving us an opportunity to see the wonderful silver collection and the collectors medicine cabinet made of that amazing burl wood and filled to the max with all those exquisite little potions. What a treat for the senses! Oh too much praise Elizabeth! It would be a wonderful challenge though, wouldn't it? On Friday I'm going back to the museum and I'll try to take photos of the baby houses to post here. Thanks for such an inspiring post, Josje, your photos are excellent and that collector's cabinet is the most amazing thing! Having watched an excellent UK TV programme on the reopening of the Rijks, our family intends to hop on Eurostar and see it for ourselves before too long. We have Dutch roots and some cousins there who are long overdue a visit too! You're welcome Chas! I hope you'll be having a wonderful family and cultural visit soon! Zo fijn dat het Rijks weer open is. Op tv heb ik al heel wat moois gezien, waaronder die apothekerskast. Ik hoop dat ik dit jaar nog kan gaan, vanuit het zuiden moet ik de reis eerst goed plannen. Wil dolgraag weer de mooie poppenhuizen zien en dat miniatuur zilver en ach zoveel moois om te zien. Bedankt voor de prachtige foto's. Graag gedaan Inge. Vanuit het zuiden is het niet ergens waar je 'even' naar toe gaat, maar zo'n dagje is zeker het plannen waard! Hi Josje! Thank you for the tour. What a wonderful place to visit. It must be wonderful to walk through those rooms and admire all the beautiful craftsmanship! Your welcome Lucille! Yes it is a lovely place to just spend some time and admire the beautiful art on show. I really missed it when it was closed for so long! Dag Josje, Ik vond zojuist je blog en wil je bedanken voor de mooie reportage van het Rijksmuseum. Vanuit Frankrijk heb ik de opening op televisie gezien en was zeer onder de indruk. Jouw foto's geven geweldige informatie. Als we weer eens in Nederland zijn ga ik zeker kijken. Ik ga je graag volgen. Groeten van Lilian en je bent van harte welkom op mijn blog. Ik schrijf over Frankrijk en de mooie dingen die ik daar vind. Wow, Josje! That Baroque room is Divine!!! I LOVE the wood carvings and the mantlepiece... and the ceiling... No wonder your feet hurt, but what a worth while Visit! Those mini silver pieces are Stunning! So much Inspiration for mini making.... I can't wait to see what you will add to your Canal House!!! Beautiful! The silver miniatures are fabulous, as is the full-sized Beuning room. How beautiful that would be in mini. Thank you for sharing. You're welcome! It would be an immense challenge for someone. 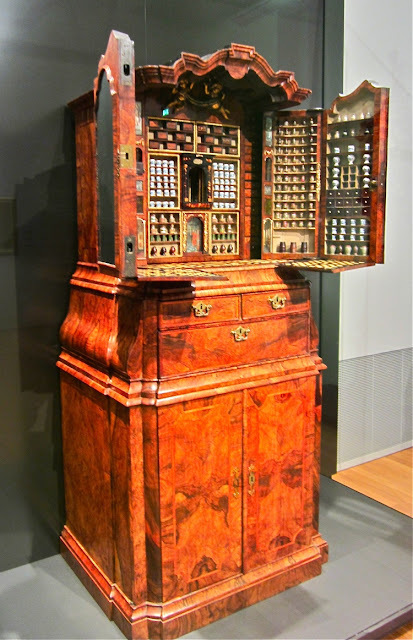 I don't think I would try this in miniature as the woodwork is very complex and intricate. But it certainly serves me as inspiration!